Synergy Group Australia is a leading provider of professional consulting services to the federal government and not-for-profit sector and the firm’s performance was recognised with a Telstra Business Award in 2015 and National Accounting Award in 2016. Since then, Synergy has been rewarded with more complex ‘whole of government’ tasks and its reputation for achieving results is spreading. With significant growth, the challenge of attracting and retaining quality staff to manage current and future workloads has emerged. contentgroup was engaged by Synergy in the second half of 2015 to develop a content communication strategy and then oversee its implementation. We guided Synergy through our content communication method across three workshops and a variety of face-to-face meetings. During these workshops we defined Synergy’s audience, the content they would like to receive and the channels by which they would like to receive that information. The result of this strategic phase was a plan that had the primary focus of recruiting more staff members to the company. 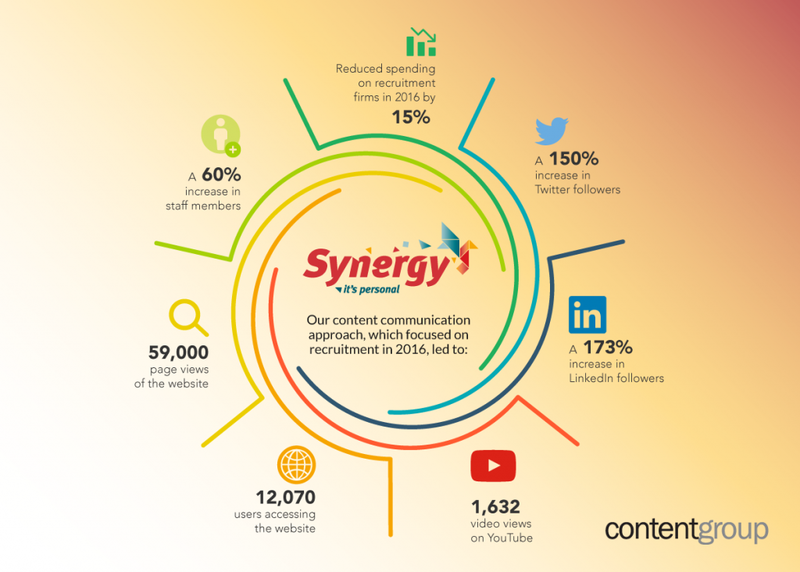 In the implementation of Synergy’s content communication strategy we have been responsible for content development (video, text, stills), social media management, website management, public relations and ongoing strategy. This work is underpinned by constant measurement and evaluation to ensure progress is being achieved against the communication and business objectives. The effective and regular engagement with the targeted audience has resulted in an increased level of awareness of Synergy. Importantly it has allowed Synergy to build a trusted relationship with potential staff and clients, leading to a 60% increase in staff members in the last nine months. We continue to work with Synergy to provide strategic advice and meet their recruitment, brand recognition and thought leadership objectives.